I remember being horrified years ago when I learned how many of my daughter’s pre-school classmates were being given Benadryl by their mothers just to get them to bed earlier. I felt this was abusive parental behavior. I really wanted to call the cops. When I questioned a few of the mothers about their actions they tried to weasel out of it by saying they wanted the evenings to themselves after a whole day of caring for their children. These are the same women who couldn’t wait to get married, quit their jobs, and have kids. Turn the clock forward about 28 years. Benadryl is no longer being used to calm the kids down as much. This drug has been replaced by iPhones and iPads. In the last year or two, parents are discovering that small and large digital devices are great soothing companions for young children. The same first time parents who swore to me that they would never allow their children to watch TV because they wanted them to develop their imaginations, just got their kids iPad minis for Chanukah and Christmas. While I laughed myself silly behind their backs, I was quite pleased that they are encouraging their children to be a part of the digital revolution. An early child educator recently told me that gadgets and smart phones provide excellent creative stimulation while also helping to develop reading and motor skills. I must say more and more parents are discovering that the positive side of the digital revolution far outweighs their so called isolation concerns. In fact the toy industry admitted that they had heavy competition this holiday season from digital products. A recent survey of 1,000 parents with children between 2 and 10 found that more than half planned to buy a tech item for their children this holiday season. About two-thirds of those planned to give a tablet or smartphone, according to the survey, which was taken for PBS Kids, the brand of the public broadcasting network aimed at young children. 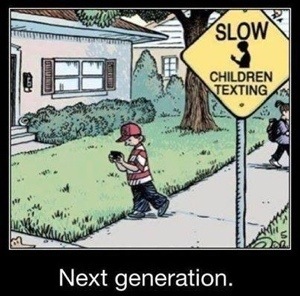 I am very happy to see that smart phones and tablets have replaced drugs for children. I wonder if these same adult children of today will be as kind to us when they become our caregivers.